Year after year we celebrate the holiday season with rituals, gatherings of friends and family, and most especially, food. With December upon us, our lives get busier while we try to wrap up our work projects for the year while juggling social calendars full of work parties, friends, and family get-togethers. 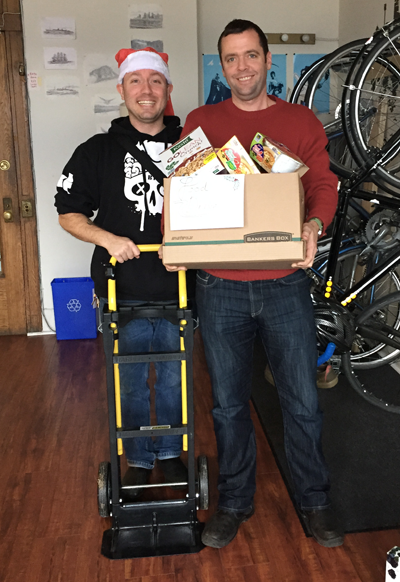 Last year during the holiday season we were part of the first annual Startups Care Food Bank Drive, which raised over $5,000 plus 3,500 lbs of food for the the Greater Vancouver Food Bank. This year we’re taking part in it again, and we’re sure that as a community we can do better. You can join us by donating non-perishable food to the Greater Vancouver Food Bank, or by dropping it off at our office in the Dominion Building if you’re in the neighbourhood and want to see our smiling faces. If that doesn’t work, you can help by with a donation to our Startups Care fundraising page. Many of us have never known how it feels to be truly hungry during a holiday season when all of our rituals and celebrations seem to revolve around food - from enormous family meals to having the kids leave milk and cookies out for Santa on Christmas eve. If enough of us help out with donations of food or money that allows the Food Bank to purchase the items they most need, then maybe we can keep that from happening to some our neighbours. Sometimes the need is obvious -- we can see that daily walking up to our office in Vancouver’s Downtown Eastside. The need is not always so obvious, though; it can be surprising to learn just how many people need some extra help with feeding their families. We’re in a position to help right now, so we are. If you are too, please join us by donating non-perishable food or money to the GVFB — we have a collection box in our office, or donate online, or whatever works best for you. Because some holiday rituals are worth repeating year after year.